The dice have been cast – and the two finalists of the 2013 Men’s World Championship are hosts Spain and EHF EURO 2012 champions Denmark. he Spanish dream became reality on Friday (25 January) evening when the Iberians made it to the final on home ground after a well-deserved 26:22 (13:12) semi-final win against Slovenia. And like two years ago at the final tournament in Sweden, Denmark have again reached the final on Sunday (throw-off time 17.15 hrs. local time). In a tough, but finally unexpected clear semi-final duel Denmark beat Croatia 30:24 (14:11). The utterly disappointed Croatian team will fight for the bronze medal against their neighbours from Slovenia on Saturday (19.00 hrs. local time). For Spain it is second final in the history of World Championships after 2005, when they beat Croatia in the final in Tunisia to win their only title to date. Denmark play their third World Championship final after 1967 (defeat against Czechoslovakia) and 2011 (defeat against France after extra-time). Matchwinner for the Danes was goalkeeper Niklas Landin - and they also took revenge for their clear ten goal defeat at the Olympic Games against Croatia. For the Croatian team the match against Slovenia will be their third bronze final in only twelve months after winning those medal games at EHF EURO 2012 against Spain and at the Olympic Games 2012 against Hungary. In London, Denmark have beaten Spain closely in the Preliminary Round. 2011 at the World Championship in Sweden and 2012 at EHF EURO in Serbia, the Danes clinched their berth for the finals by eliminating Spain. Against Slovenia, Spain improved in the middle of the second half, extending the gap intermediately to eight goals thanks to their brilliant defence including outstanding goalkeeper Arpad Sterbik. In the first half the brave Slovenians had closed a five-goal gap in the first half of their first World Championship semi-final, but then they lost their momentum. By scoring seven straight goals to make it from 15:14 to 22:14, Spain decided the finally one-sided semi-final. Coach Valero was very glad to be part of the much wished for final in his home town Barcelona: “I am very satisfied with the result and the way we played and I have to praise the audience which supported us in the same way as in Madrid and Zaragoza before. WWe hope that together with them we can become world champions on Sunday." Slovenian coach Boris Denic could still smile despite the defeat: "It was a deserved Spanish victory in a game not beautiful for spectators, but highly interesting from the tactical point of view. The saves of the Spanish goalkeeper made the difference." The second semi-final was as clear as the first one: Denmark were in the lead throughout all the entire 60 minutes, the key to success were Landin's saves in the opening stage, when his team forged ahead to a 6:1 lead – a quite comfortable cushion for the rest of the match, as Croatia could not manage to play their well-known powerful and fast game. They only caused difficulties for Denmark right after the break, when they reduced the gap to 14:16, but the Danes were too clever and as cold as ice later-on, deciding the game at the latest at 26:20. "We had very much respect for Croatia, but we had a plan to start very fast in the beginning of the first and the second half. "Croatia did not find into this match. 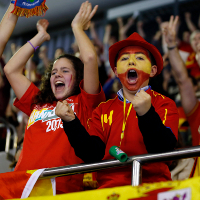 Now it will be very difficult to play against the hosts Spain and to play against 16,000 spectators. But it does not mean that we cannot beat them," Danish coach Ulrik Wilbek said as hopes for his first gold medal with the men’s team after he had become world, European and Olympic champion with the Danish women in the 1990s. For matchwinner Niklas Landin the team spirit proved decisive: "I did not win the match, but the whole team did. We showed a brilliant match against a strong opponent. If we play like today on Sunday, we will dream our dream and become world champions." Wing player Hans Lindberg shared those hopes: “Hopefully now the time has come for us, even if we are not the favourites. Before the tournament I said Spain are the favourites, now I hope that my prediction was wrong…"
For Croatian coach Slavko Goluza the tough quarter-final against France was one reason for the defeat after they had been the best team at the tournament before. "We lost a lot of energy so we were not in the shape we should be. As everybody saw, we had a bad start against an incredibly strong team."